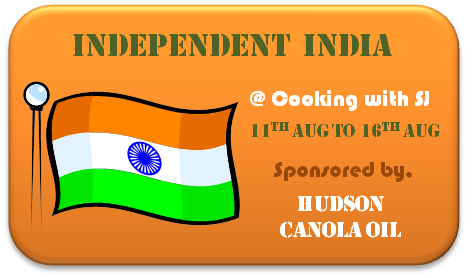 Today, India celebrates her 68th Independence Day. Happy Independence Day!! 🙂 Thus keeping with the spirit of the Indian Independence Day Celebrations, i so wanted to post a dish depicting the colors of our National flag, that is saffron, white and green. The colors in our national flag is a horizontal tricolor in equal proportions of saffron on the top, white in the middle and dark green at the bottom. The top saffron colour indicates the strength and courage of the country. The white middle band indicates peace and truth with Dharma Chakra. The green shows the fertility, growth and auspiciousness of the land. During my school days, i remember we all students used to gather and celebrate our Independence day by taking a parade starting from the school play ground and ending the parade near the stage. And later, the principal along with chief guest acknowledging the parade, watching the hoisting of the National flag and the saluting of the flag, singing Vande Mathram and thereby few programs by the school students; and finally ending the program by singing our National Anthem. Later sweets, chocolates and toffees were distributed after the function and the day off from school. 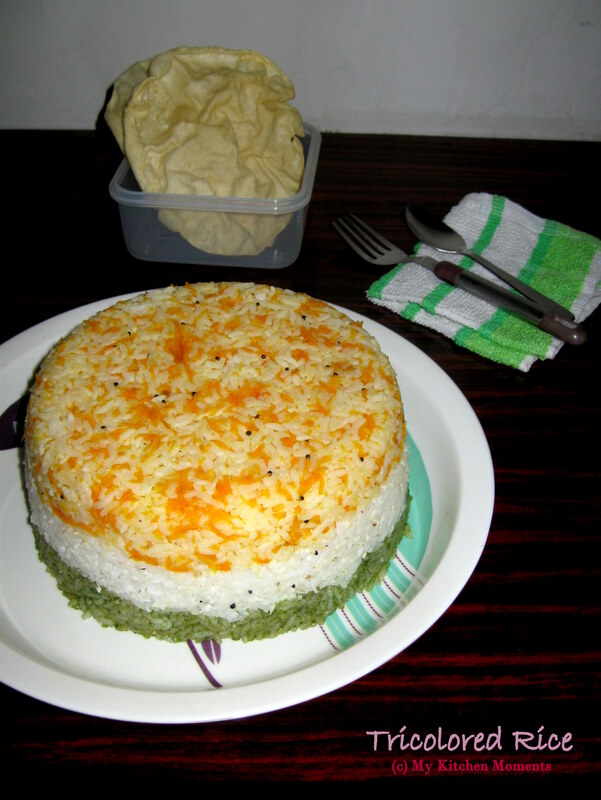 I remembered seeing a tricolor rice in the newspaper cuttings that i have cherished for a long time and thought to give it a try in my kitchen. Since we South Indians usually have rice for lunch, i prepared this at home today. 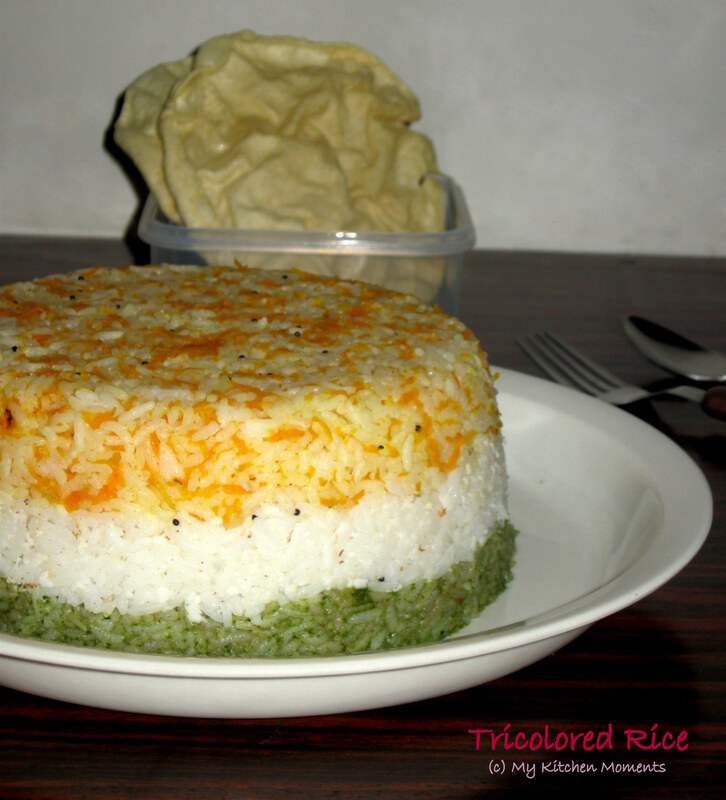 So here is the tricolored rice. Cook the rice in the pressure cooker with water and required salt for up to 4 whistles. Once done, remove from flame. When the pressure leaves from the cooker, remove and place the rice in equal quantities in a plate and allow it to cool. Method to prepare the Saffron / orange-colored rice – Place a kadai or a small pan, add the oil and put the mustard seeds. Allow it to temper. Then add the red chillies and the shredded carrots and fry for about 5 minutes or until it’s done. Once the shredded carrots are cooked well, add required salt for the shredded carrots alone and mix well. Remove from flame and set aside. Method to prepare White colored rice – Place a pan, pour oil and put the mustard seeds and allow it to temper. Then add urad dal and red chillies. Fry for a minute only and add the scraped coconut and fry until the coconut shreds are slightly brown but not too much. Remove from flame and set aside. Method to prepare Green colored rice – Place the finely coriander leaves, green chillies, tamarind pulp, salt and blend it to a smooth paste. Then place in a pan/ kadai in a low flame, pour a little oil and sauté the blended coriander paste for a 2 to minutes till the raw smell disappears. The remove from flame and set aside. Now the 3 different layers to prepare rice is ready to mix with the cooked rice. Mix the different colored pastes on the warm rice and mix the rice uniformly. Take care to see the rice doesn’t get broken and mushy. Then in a large dish, put the orange-colored carrot rice at the bottom, press well with the back of a large spoon. Then place the white colored coconut rice in the middle, press with the back of a spoon. And lastly place the green colored coriander rice on the top and press similarly. Press each layer down well before adding the next. Cover the dish with your serving plate, and slowly invert the rice onto it. Tap the dish gently and the rice should turn out onto the plate, orange layer on top, white rice in the middle and green at the bottom. Serve the rice with pappads or potato chips or banana chips or plain curd or raita or Indian styled pickles. And relish!! Next Post Many more Awards… And a note of Thanks to all! Thank you Srividya 🙂 Yes, i miss hose school days!! Wow…so cool! Happy belated Independence Day! This is so pretty, kinda reminds me of Japanese sushi cakes! Beautiful dish Aishwarya. ..and happy independence day…. Thank you Garima 🙂 ❤ Happy I-day to you too!! Thank you so much dear 🙂 ❤ Belated Independence day wishes to you too! How gorgeous! Happy belated Independence Day! Wow that rice looks incredible. What a fabulous idea. Emma. Thank you dear 🙂 Better late than never! wow, what beautifull rice dish!!! !